Yet, as #jesuischarlie hashtags proliferate, violence carried out by supporters of a far-right brand of totalitarianism, radical Islam, is met with thundering silence in the West. Most disturbing is the response of progressives. Recent events demonstrate that a section of what purports to be the left wing no longer stands unequivocally against all forms of fascism and racism and is prepared to ignore or, worse, excuse an ideology that rejects Enlightenment values and promotes a racist, misogynistic and homophobic death cult. Why the silence of the left on anti-Semitism? On February 15, 38-year-old volunteer security guard Dan Uzan was shot and killed outside a Copenhagen synagogue during a bat mitzvah celebration. A month earlier, a gunman executed four customers at a kosher grocery store in Paris. In May 2014, a gunman killed four people at the Jewish Museum in Brussels. In 2012, a gunman murdered three students and a teacher at Toulouse Jewish primary school in south-west France. Eight-year-old Miriam Monsonego was shot point-blank in the head. You might discern a common theme to these shocking crimes. Seventy years after the Holocaust, Jews are again being murdered in Europe for being Jews. These recent outrages are but the tip of an anti-Semitic iceberg. About 7000 French Jews made aliyah (migrated) to Israel last year. For good reason. Jews make up 1 per cent of the French population, but half of all racially-motivated crimes during 2014 targeted Jews. In recent weeks several hundred graves were defaced at a Jewish cemetery in north-east France; in Germany a synagogue in the city of Wuppertal was firebombed. This is to say nothing of Jew-hatred besides physical violence. During last year's Gaza conflict European protesters chanted "Gas the Jews" and "Death to the Jews". In several countries, Jews are being warned not to wear religious clothing or enrol their children in schools with a high numbers of immigrant (allegedly Muslim) students. Far-right, anti-Semitic political parties are gaining ground across Europe. In a Greek government dominated by the far-left Syriza, right-wing ally and defence minister Panos Kammenos says that his Jewish compatriots don't pay taxes. In Britain, a recent all-party parliamentary inquiry into anti-Semitism showed an alarming rise in such bigoted attitudes. Australia has not been immune. A video produced by the Islamist group Hizb ut-Tahrir shows the organisation's head, Ismail Al Wahwah, alleging that "where Jews thrive corruption abounds" and that the world is afflicted by the Jewish "hidden evil". Condemnation has been non-existent or heavily qualified. What about Anders Breivik, they say? The killers have nothing to do with Islam – despite most attacks being launched with the cry of "Allahu Akbar" – but are alienated, radicalised "lone wolves", the argument goes. Some seek to place the blame on Jews. A BBC anchor suggested that violence directed against French Jews might be understandable given Israeli policies towards the Palestinians. A left-wing Australian "anti-Zionist" tweeted that should Israel's oppression of the Palestinians continue, more attacks on Jews would follow. The normally voluminous twitter feeds of leading progressives are mostly devoid of sympathy or solidarity. At the root of this silence is denial. 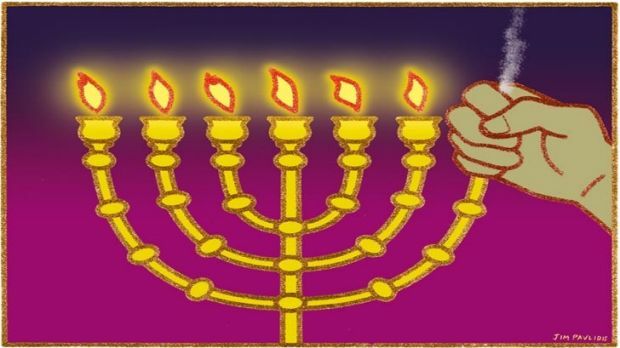 A denial of the seriousness and source of the new/old anti-Semitism, whereby a classical racial/religious hostility to Jews has conjoined with a politically motivated denial of the rights of the Jewish people to a state of their own. Yet it is clear that the recent European attacks have occurred in cities that host relatively large migrant Muslim communities, of which a small but significant minority are willing to act upon the message of jihadist militancy fostered by the likes of ISIS. These outrages have also drawn less opprobrium from progressive sources because, as militant opponents of the policies (and often very existence) of the State of Israel, they view anti-Semitism as a term deployed by Zionists to deflect criticism. Moreover, confronting the resurgence of anti-Semitism would mean accepting that the demonisation of Israelis and Jewish diaspora – such as the toxic Boycott, Divestment and Sanctions campaign that effectively calls for the destruction of Israel – has in part contributed to the legitimation of violent attacks against the Jews of Europe. Instead, we have seen a bizarre reversal of victimhood. The first instinct of many, rather than sympathise with the victims of terror, has been to warn against a potential Islamophobic backlash. According to this warped and infantilising logic, Muslims, as the "new" Jews, are all innocent victims of Western (and Israeli) imperialism and racism. No one wishes to see the peaceful majority of the world's 1.5 billion Muslims subject to discrimination because of the actions of a minority. We are not, as Roger Cohen has written in these pages, at "war with Islam". However, fear of giving offence or singling out a minority for criticism is scarcely a reason not to oppose anti-Semitism. What then is to be done? Israeli Prime Minister Benjamin Netanyahu is wrong to call for Europe's 1.4 million Jews to consider a mass aliyah to Israel. This suggestion can only embolden the thugs seeking to hunt the Jewish people off the continent. Rather the solution is easy and begins with us. We need to talk about the threat of modern anti-Semitism not as some 1930s throwback but as a real and present danger. The next time you are privy to anti-Semitic abuse, speak up. The next time a protest calls for the destruction of Israel, or explains away terrorism with "but Israel", speak up. Do so as a matter of principle. But we should also not forget the darkest chapter of European history: fascists come for the Jews first and never stop there. Nick Dyrenfurth is the co-author of Boycotting Israel is Wrong: The progressive path to peace between Palestinians and Israelis (to be published in May by NewSouth).